Have a look at the pictures of Duettos in the various colours. 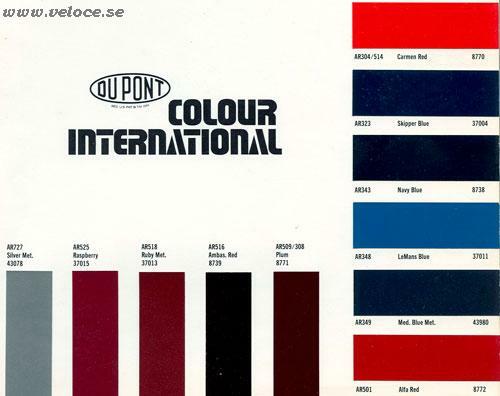 The 1968 colour information From the sales material and www.Cardisk.com is here: colour chart, then the Duetto options, the Berlina combinations and the GT Veloce chart. You will find the colour code on a small plate under the boot lid to the right. If you respray, any local paint shop will be able to mix the red colour you like if you tell him the OEM #. The red colour chart is here. I have spent lots of time doing this chart, so please ask me first before you copy and use it. Wille R.
Some classic Alfa Romeo colours, sorted by code #. AR727 Grigio Chiario Met. - Light Grey Met. AR728 Grigio Medio met. - Medium Grey Met.